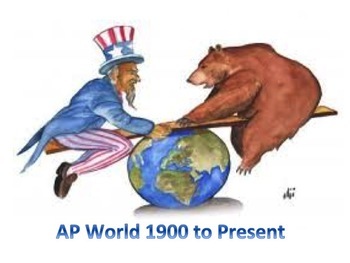 This assessment includes 50 stimulus based multiple choice questions for Period 6 1900 CE to the Present based on the new 2016-2017 re-write of the AP World History curriculum. The questions are aligned to both the revised 2016 College Board Curriculum AP World Framework and to the nine historical thinking skills emphasized on the exam. Each question is clearly marked for easy inclusion on standards based assessment platforms like Mastery Connect. Keywords: 2016-2017 AP World History test, Advanced Placement World History, WHAP multiple choice, revised AP test, stimulus questions, test bank. I will be releasing more questions by time period all year long. All questions copyright 2017 by Kimberly Zerbst. Purchase of the product includes permission to use and edit questions for use on paper unit tests within a classroom, and to make one copy of the test per student. Copyright does not include the right to use questions for electronic testing, any kind of posting online, or for sharing with other teachers. ***Please protect the security of these questions and do not post them online.